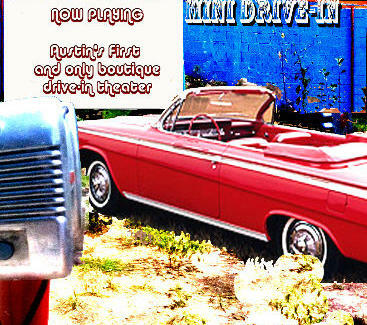 The latest addition to the Starving Art compound, the Mini hosts six stations of vintage window speakers at which to park your ride and recline to classic flicks. This week's selections include a triple threat of Asian directors (Chan-wook Park, Fruit Chan, Takashi Miike), a free screening of Pee Wee's Big Adventure, and the Drafthouse-sponsored premiere of Frank Black's score to the 1920 film Der Golem -- which was silent, so nobody had to ask "Where is my line? Where is my line? Wheeeere is my line?"